The script for the Aussie Open final was simple. The Next Generation stars had huffed and puffed – and they’d again faltered. Fifty-one of the last fifty-six men’s Grand Slams have been won by the Big Four – Roger, Rafa, Novak and Andy Murray. Some suggested with a wink that Slams might just bypass the early rounds and fast-forward to the end game – with Rafa, Roger and Nole. Here in Melbourne, after icon Andy Murray had retired, Federer, Sascha Zverev and No. 1 Simona Halep had all fallen, a “let-er-rip” Aussie tennis civil war had flared, the Barty Party had ended, Serena had failed to convert four match points, after a fresh-faced Greek god named Tsitsipas proved mortal and after Naomi Osaka had at last triumphed in unabated glory, we were left with what we’d expected all along – No. 1 Novak versus No. 2 Rafa, in their 24th final and 53rd match overall. We knew that these two heavyweights had more similarities than differences. Yes, Rafa is a year younger and an inch shorter, and trailed 25-27 in their sizzling rivalry. Still, both have powerful family ties rooted in European villages. Both went into the final rested. Neither had to cope with a crisis. Kei Nishikori was the only top ten player either faced. Last year Nole had had elbow surgery – more recent were Rafa’s feet, knee and abdominal issues that had sidelined him since the US Open. Yet both were playing lights out. What isn’t weird is that Rafa and Nole were courting a slew of records. With 17 and 14 Slams respectively, both have a realistic chance to catch Federer, who has 20. 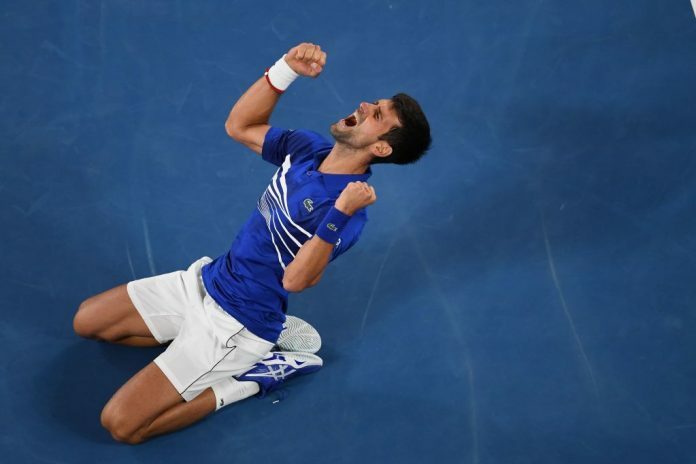 Nole was hoping to win his third straight Slam and a record seventh Aussie Open. He adores Laver Arena and he’d stepped up his game at crunch time against Rafa in their epic Wimbledon semi last year. Nadal, who has only one Aussie Open title, was seeking to be the first player in the Open era to have won all four Slams twice. Something had to give. Sports can shock us. Tennis has done that of late. There was the US Open women’s final – and Osaka’s followup triumph last night. Tonight, Djokovic got off his seat and punched Rafa in the face, so to speak. The Serb knew well that Rafa comes out quickly and tries to impose his presence. Nole knew that a fast start was crucial. What was up was that here was an athlete who was bringing everything. Novak’s abilities astound. He hit out and found his targets – close to the lines. His core strength and torque were on full display. His court coverage amazed. His fast, fluid movement is a weapon. He bends low and then unleashes power groundies. He morphs defense into offense – changing the direction of shots is a Nole speciality. Angles emerged with geometric precision. Stepping in, he took Rafa’s time away and kept him back beyond the baseline. Taking the ball on the rise, Nole uses his perfect hand-eye coordination to flick shots flawlessly. His technique has an ease. It flirts with perfection. Nadal has always relished challenges. He’s right-handed, but his uncle Toni taught him to play left-handed. It used to be that Spanish clay-courters made no real effort to master grass and prevail at Wimbledon – but Rafa has won there twice. Most recently, he’s been working on a new, shorter, energy-saving service motion. Yet tonight it was Djokovic who was dominant on serve. In just 36 minutes Novak claimed the first set. But Rafa, along with Jimmy Connors and Lleyton Hewitt, are the greatest male battlers our game has seen. “There is only one man who can take all these punches and come back and win.” noted Steve Pearce. Rafa tried to stem the Serbian surge – but had no real answers. The man who so often schools lesser players was being schooled. He could barely string points together. The No. 2 player in the world seemed hapless – he only got one break point. As the evening light faded, so did Rafa’s chances. Novak relaxed – he was in the zone. His 6-3, 6-2, 6-3 victory, including only nine errors, was a beatdown – 23 minutes shorter than the woman’s final. He added, “I always believe in myself. That’s probably the biggest secret of my success…self-belief, always digging deep in the moments when you’re facing adversity…visualizing yourself as a winner, trying to be in a positive state of mind. It’s much easier said than done…I had to do that more than ever…after the surgery because…I was questioning everything, I was doubting whether I would be able to play anyone. So is tennis. Federer’s grace and elegance give us an incandescent artistry. Rafa, especially on clay, brings a ferocity that astounds. But tonight, Djokovic was on fire and in full flight. He was powerful, yet seemed to float. When yet another Rafa backhand flew long, Novak knew he’d broken Roy Emerson’s record of six Aussie titles. Now, having won 15 Slams, he’d surpassed even his idol Pete Sampras. Moments after his triumph, Novak was offering his traditional from-the-heart victory gesture to the appreciative crowd. Tonight we saw a champion’s heart – and much more. Of course we wonder, can Nole, who has now won three straight Slams, prevail on his off surface and win Roland Garros, to claim the “Novak Slam?” Or will Rafa, the king of clay, avenge his defeat in Paris? And, can Novak, with his 15 Slams, eventually surpass Roger, who has 20 and is five years older? What we know for sure is that the reflective Serb, known for his deep-dive inner journeys, tonight took tennis to outer space. Speed, power, athleticism, mental strength, flexibility, focus – Novak displayed what all great athletes bring to the big stages. He did what only the truly greats do: he took his sport to a whole new level.